Advertising and promotion are a necessity for every business and it holds true for Zomato as well. The restaurant-finder service provider is known for its smart marketing tactics and out of the box creativity. However, sometimes people may not like the way you market yourself despite the fact that you were just trying to be creative and had no intention of offending anyone. 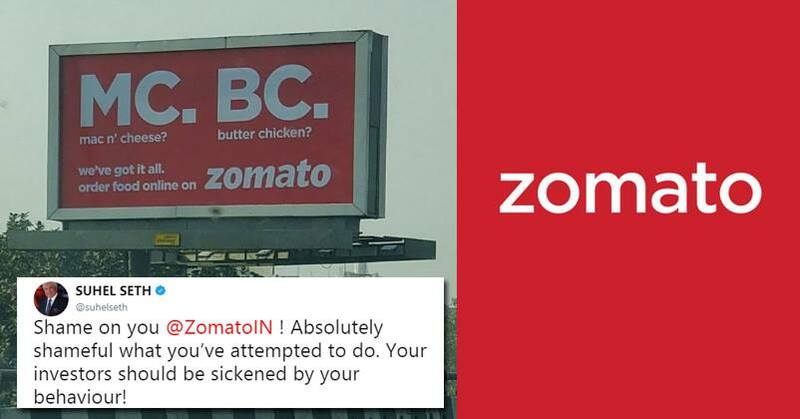 Zomato has launched a marketing campaign and it has put up billboards in major cities with very catchy lines and slogans but one of them didn’t go well with some people. Honestly this is regressive advertising. i saw another v sickly regressive ad from camlin marker pens. what’s wrong ppl? can’t we have advertisements which don’t sound crass and can be enjoyed by all age groups? So the PR bandwagon of Zomato’s new outdoor campaign is rolling. “Hey, while we didn’t mean to, we can see why it can be offensive to people, and we apologize for it. Hey, while we didn’t mean to, we can see why it can be offensive to people, and we apologize for it. What is your take on this matter? Do let us know.